Home / Archive by category "Training and Mentorship"
The cornerstone of JAWS’ work is training and mentorship. Often this takes place at our annual Conference and Mentorship Program (CAMP) gathering, but we also strive to provide opportunities for members to connect through regional gatherings and trainings. In addition, we also work to partner up mentors who wish to share their experience and expertise with mentees who seek to grow, advance and lead. We call this symbiosis, as mentoring is often a two-way exchange. 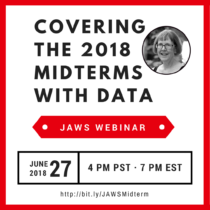 Are you watching the primary results roll in and gearing up to cover the 2018 midterm elections? With a record number of candidates running for 435 seats in the United States House of Representatives and 35 of the 100 seats in the United States Senate – not to mention numerous state and local elections – the midterms will be a prime subject for reporters at the local and national level alike. We will continue leading the conversation at the Journalism & Women Symposium’s annual Conference and Mentoring Program (CAMP) in Welches, Oregon, this fall where we will master new skills, make lasting connections and rejuvenate after another busy news year. What’s kept you from becoming a mentor, or seeking out a mentor? The cornerstone of JAWS is our mentoring program, which is open to all members. 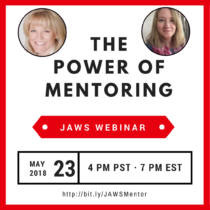 On May 23 at 7 PM EST/4 PM PST, we are offering a free webinar about the “Power of Mentoring,” where we will address your burning questions about the essentials for first-time mentors and mentees. Register here. Want to learn how to track shootings by police in your community? Are you curious about how to go about investigating your local police department? 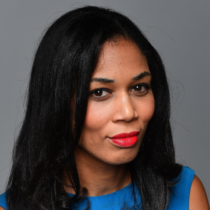 Join the Journalism and Women Symposium for our upcoming webinar hosted by Washington Post investigative reporter Kimbriell Kelly, who was part of the 2016 Pulitzer Prize-winning team for the Post’s series on fatal police shootings. Amy, editor-in-chief of Reveal, will guide us in the aggressive, specific use of Freedom of Access laws to hold our public officials accountable. She will draw upon her expertise leading a team of editors, reporters and producers who produce unique in-depth national stories. Victoria, General Counsel at Reveal, has worked for the Reporters Committee for Freedom of the Press on matters involving the intersection of technology and media law, access as well as privacy and government surveillance. 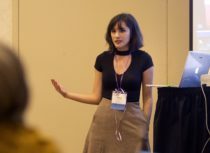 Each year the Journalism and Women Symposium (JAWS) brings fellows to our annual Conference and Mentoring Project (CAMP) for three days of training, networking and professional development. 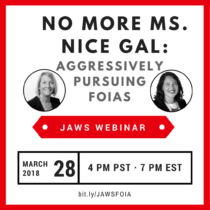 Each year the Journalism and Women Symposium (JAWS) brings fellows to our annual Conference and Mentoring Project (CAMP) retreat for three days of training, networking and professional development. And the above quotes are just a few of the glowing things past fellows had to say about attending CAMP. Journalism and Women Symposium really needs you—yes, you!—and your wonderful ideas! are accepting proposals for panels and workshops for this year’s Conference and Mentoring Project (CAMP) in Oregon, and we’re extending the deadline to Friday, Feb. 2. Close your eyes and imagine a working class American. What pops up for you? A white man? A black woman? Someone from rural Kentucky or D.C.? It isn’t just war zones where your life can be in danger. The story of Kim Wall, a Swedish reporter brutally killed while working on a freelance story aboard a privately owned submarine, reminded foreign correspondents and freelancers working overseas that even in a relatively safe country, everyone is vulnerable. Know the subject, never give up and, when the time comes, shut the hell up. These were some of the tips to on getting interviewees to pen up about difficult subjects like corruption, violence and identity. Going viral on Facebook takes more than just a catchy headline or outrageous content. For journalists who want to feature serious subjects and highlight important discussions of the day, Facebook videos must be carefully tailored to grab and keep hold of the audience.